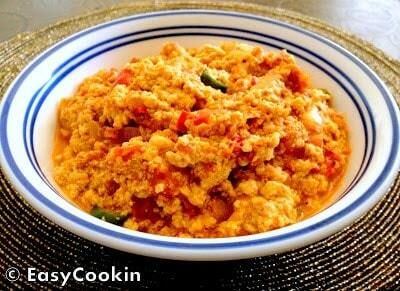 Paneer Bhurjee – Indian Cottage Cheese Scramble: a delicious side recipe that’s a favorite among kid and adults. This is a quick, easy and multi-purpose recipe which can be served as breakfast, lunch, snack or dinner. Serving Suggestion: Can be served with Roti / Rice / Bread or Eaten as is. Heat oil in a nonstick wok, add and sauté till pink in color. Add cheese / fresco/paneer in onion mixture and sauté for 5-6 min. Add powdered spices, tomato and saute for 3-4 more minutes. Now the cheese is almost cooked, crumbly in texture and would leave water on the edges. Add ketchup, green chilies and sauté for 2 more min. 2 Replies to "Paneer Bhurjee - Indian Cottage Cheese Scramble"